Learn more about Kornblitt Tours! It’s big. It’s glitzy. It’s noisy. 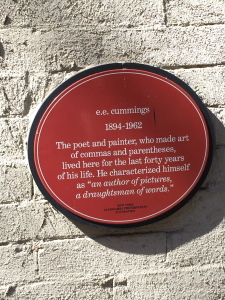 Greenwich Village has those qualities! Crooked streets in the West Village. Counter Culture. Avant Garde. Jazz, blues and rock and roll bars. 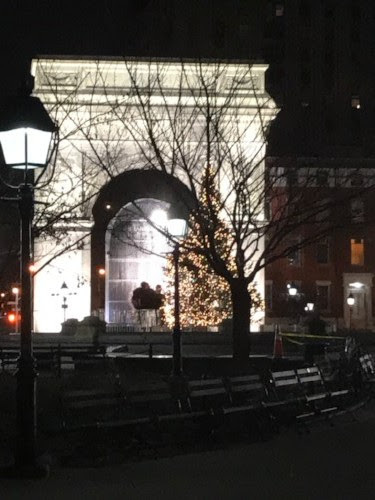 Beautiful Washington Square Park with the magnificent Washington Arch. NYU. The vibe in Greenwich Village is different. It’s much more laid back. Very cultural and dare I say Romantic! Even if this trip is not the romantic type…the tips below will serve you well. Enjoy! We suggest that you call the hotel directly…. you can ask for Charlie who is a manager and let him know you are referred by Kornblit Tours. 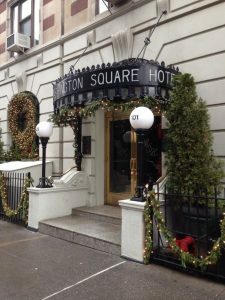 Splurge and ask for the Executive King room with a corner view of Washington Square Park…the room is spacious by NYC standards and has a beautiful bathroom with double sinks and a modern shower. Ask for the VIP breakfast at their restaurant called North Square. 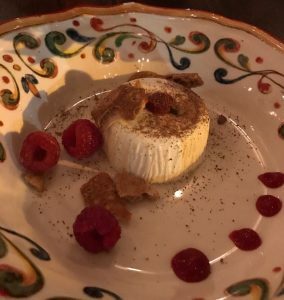 The Lemon Ricotta Panna Cotta dessert is to die for! This restaurant is also Italian and specializes in Fish, Seafood and Grilled Italian vegetables. The House Antipasto is a must and can be shared by the table. If it is a huge hit, you can always order another. Lady Bird – great vegan option! An intimate bar with small tables that doubles as a vegan tapas bar serving delicious vegetable dishes and a Chocolate Fondue to finish the night! An arts and cultural hub in Chelsea (near Greenwich Village) featuring art and ideas of the Himalayas and neighboring regions including India. 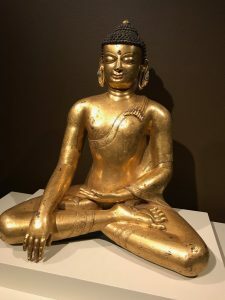 If you are into Yoga, the Buddha, meditation…definitely for you! We will take you to the most iconic Greenwich Village sites and hidden gems of this very romantic neighborhood! What strikes me most about the Brooklyn Bridge is its beauty. As you approach it’s walkway, there is a sense that is thrilling. Here I go, about to walk on a bridge that is magnificent – it’s spires and shapes are geometric and artistic, the views are stunning in every direction, and the fact that I’m afraid of heights, but not on this walkway is amazing to me. The bridge appears as an apparition of sorts in the midst of the Financial District surrounded by architectural marvels from the 1800’s to the modern day. There are so many people on the bridge, so many languages overheard, so many photographs being taken. It is a destination for the tourist, the photographer, the bicyclist, the jogger, the walker, the poet, and the special occasion enthusiast. Yesterday we were witness to a sea of pink ladies walking the Avon Breast Cancer walk. A fitting destination for a group of women survivors to be walking on a bridge whose completion may not have occurred if not for a woman. For we learned yesterday that Emily Warren Roebling was the wife of Washington Roebling who could not continue construction of the bridge due to contracting caisson’s disease, becoming bed ridden. This was the terminology of the day to describe the same phenomenon that happens to deep sea divers when they rise too fast; too much pressure leading to an imbalance of nitrogen in the blood – we call “the bends.” For 14 years, Emily dedicated herself to the bridge’s completion, educating herself on construction engineering and supervising the bridge’s completion. 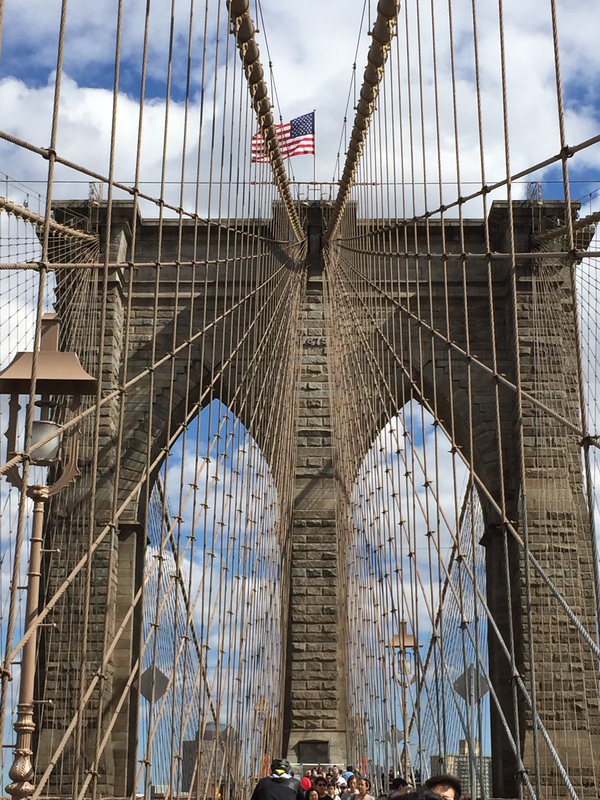 The spectacle of the Brooklyn Bridge – the blending of human feat and mother nature; the awe of it all inspires us all. We are not the first to be inspired by the Brooklyn Bridge – in 1878 Walt Whitman was also inspired. He said that his visit provided “the best, most effective medicine my soul has yet partaken—the grandest physical habitat and surroundings of land and water the globe affords—namely, Manhattan island and Brooklyn, which the future shall join in one city—city of superb democracy, amid superb surroundings.” I think Walt Whitman would have enjoyed a Kornblit Tour! Cemeteries are a place of reflection. They give us pause from our everyday routine to contemplate our purpose in life and remember those who have passed on. Cemeteries are often stops on a Kornblit Tour. This is where history truly ‘comes to life.’ Sometimes we visit cemeteries that are in ruins, for example on our Greenwich Village Tour where we visit one of the oldest Jewish cemeteries in New York City. Visiting the resting place of those that came before us gives us historic perspective and insight into our future. The cemetery at Trinity Church on our Financial District Tour is a place where we could spend hours. These burial grounds have been the final resting place for many historic figures since the Churchyard cemetery opened in 1697. Trinity Church Cemetery is a non-denominational cemetery, and it is listed in the United States national Register of Historic Places. In addition to over 60 notable figures buried here, there are two bronze plaques commemorating the Battle of Fort Washington, fought during the Revolutionary War. 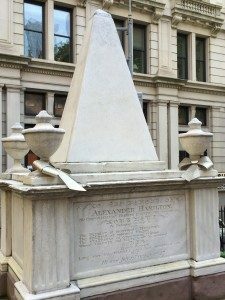 So many famous people are buried at Trinity Church Cemetery, each with a story that captures historic significance and perspective of our nation’s past. The gravestone markers help us remember war heroes, congressman, inventors, businessmen, socialites, and signers of the Constitution. 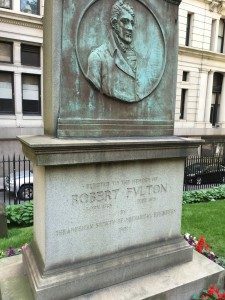 We visit the gravesite of Robert Fulton (1765-1815) who was an engineer that is credited with developing the steamboat and designing the first submarine called the Nautilus. We also pay our respects to Alexander Hamilton (1775-1804). He was one of our countries founding fathers and chief aide to George Washington. He was also the founder of our nation’s financial system, the first Secretary of the Treasury and the Father of the United States Coast Guard. If you come with us on our Financial District Tour, the Trinity Church Cemetery is our first stop and will set the stage for this historic Wall Street Financial District Tour. 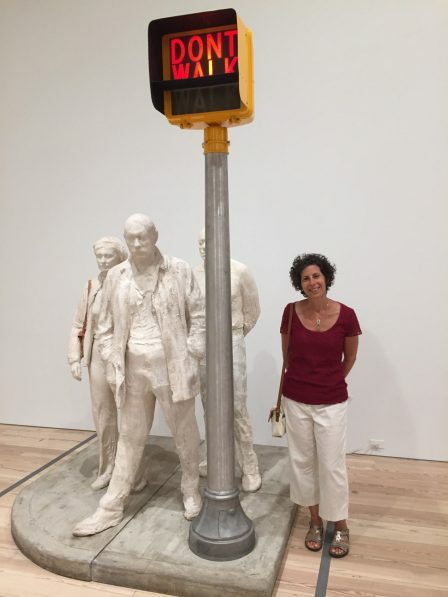 We have been looking forward to visiting the new Whitney Museum since reading the featured article in New York Magazine. It was well worth it and a nice way to spend a Sunday afternoon. We started out eating (of course! This is Kornblit Tours!) We tried getting into “Untitled,” the ground-floor restaurant, but the wait time was so long, the restaurant would have been closed by the time our seats were ready. Tip – make a reservation in advance. The next eating option was the Studio Cafe on the 8th floor which was a great lunchtime choice. The portions were decent and the food was fresh and a little different. I had toast with cucumber and guacamole. They also had a variety of soups and salads to choose from. 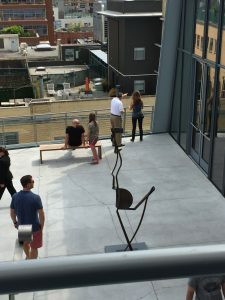 Being on the 8th floor was just where you want to start your tour of the Whitney. The gallery on this level included artwork from 1910 to 1940 – as you descend the levels, the artwork displayed increases chronologically; so the 7th floor has works from 1925 to 1960 and the 6th floor is 1950 – 1975, and so on. What is most dramatic about the museum, I thought, were the outside spaces. The architect, Renzo Piano, created areas to sit, stand, and dwell on the art outside – NYC! The beauty of the city is all around and some of the views are spectacular. There are comfortable chairs to sit and lounge and gaze at the city sites. Once again, I am convinced, there’s nothing like New York!